For almost a century of experience in the industry, Quincy’s trademark blue compressors have been working hard to build a reputation for quality and top performance in the most demanding applications. 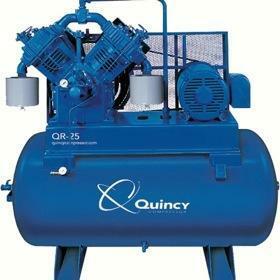 Every unit of Quincy air compressor is designed and engineered to offer long years of reliable service. This why at ReapAir Compressor Services, we take pride in distributing Quincy air compressor parts, maintenance and rental units. Today, you will find the same leadership in Quincy’s next-generation air compression solutions with great features, smart controls and green technologies. You can also count on this brand for a low cost of ownership with its stable air pressure, easy service and maintenance, and longer machine life. And equally important is the benefit of the industry-leading warranty programs with no shortcuts and substitutions for your peace of mind. With ReapAir’s repair and maintenance service, you will always have any Quincy air compressor parts needed for maintenance or repair quickly. Choosing a Quincy air compressor also means getting the proven performance and next-level efficiency, particularly the QGD and QGDV series which are packed with the latest innovations and improved benefits. These Quincy air compressor units are a complete package of true innovation and quality with the following inclusions. Greater installation flexibility - they have smaller footprint designed to run with reduced noise and vibration levels, making them perfect for almost all applications. Options of drive systems - you can choose between a reliable fixed or variable speed drive to suit your application needs. Impressive standard features - they are also equipped with premium components such as Wye Delta starting, a TEFC motor, NEMA4 electrical enclosures and package pre-filtration as standard equipment. Lower energy costs - this is accomplished by employing energy efficient technologies including a new Airlogic2 controller, an IE3/NEMA Class 1 efficiency motor, gear drivetrain and a special drivetrain-cooling canopy. Simplified maintenance - this Quincy air compressor models have new design featuring hinged, quick release panels that allow easy and instant access to consumable parts to reduce downtime and maintenance costs. Their lean, modern design provides best performance standards. We also ensure that your Quincy air compressor in Mississauga and the GTA is operating at 100% functionality through our premium repair services and maintenance. Simply give us a call to learn more about high quality Quincy air compressor products or give your existing units a regular maintenance check.